Definitely Superior Art Gallery presents 25 of Thunder Bay’s finest spoken word and singer songwriters performing for the public in a week-long series throughout the City of Thunder Bay-[120 individual performances]. Random Acts of Poetry now in its 12th year is an initiative to promote literacy, art and poetry in places where people live their everyday lives. Random Acts Of Poetry has featured over 265 writers/performers at 360 locations engaging some 100,000 in public audiences since the projects were initiated. 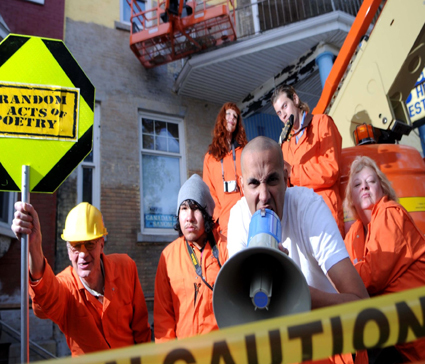 See and hear the Definitely Superior Poetry Construction Crew as they randomly bring urban interventions to our public venues, schools and institutions, coffee shops, parks, markets, radio, television, street corners, transit…your very home! Warning!…it’s Poetry Construction Season! Schedules will be available at the gallery and on facebook prior to the event for one of the largest poetry performances in Canada.